Chris Guilbeaux was born and raised in Breaux Bridge, Louisiana. Guilbeaux joined the Louisiana Army National Guard in 1979. Upon graduation, Chris completed his initial training and returned to Breaux Bridge. In October 1982, Chris joined the Louisiana Active Guard and Reserve (AGR) Program and began his career as an Administrative Specialist in the Breaux Bridge Unit. After various positions throughout Southwest Louisiana (256th Infantry Brigade),with which he served 18 years, he was selected amongst his peers to serve as the Senior Operations Sergeant for the newly formed 62nd Civil Support Team, Weapons of Mass Destruction (CST). Throughout the 18-month train up period for the CST, Chris received over 800 hours of Emergency Management, Hazardous Materials and Weapons of Mass Destruction training. In 2002, Chris retired with a total of 23 years of service. In June 2002, Chris joined the Louisiana Department of Health and Hospital’s (DHH) Bioterrorism Program and worked there for 17 months in the design of teams and training of personnel for the express purpose of responding to any Bio Terrorism incident in Louisiana or the Nation. In November 2003, Chris was appointed by the newly elected Sheriff of St. Martin Parish as the Deputy Chief of Homeland Security and Emergency Preparedness. He also served as the 911 Director for St. Martin Parish. His duties included serving as the Chief of Operations (COO) for the St. Martin Parish Sheriffs office whereas he provided leadership and guidance for deputies in Patrol, Detectives, Narcotics, Juvenile and Court Room Security. In May 2006, Chris took on a new roll in the civilian sector as a Hazardous Materials Technician and Project Manager for B & B Fire and Safety Services Inc. In July 2008, Chris was chosen to serve as the Operations Chief for GOHSEP where he led the branches of Operations, Planning and Logistics in order to insure that the State was in a constant state of readiness. That readiness was put to the test a short month later in August 2008, with Hurricanes Gustav and Ike. The Operations Section continued to be challenged in 2009 with the H1N1 flu emergency, in 2010 with the British Petroleum (BP) Oil Spill and in early 2011, with the Mississippi / Atchafalaya River Flooding. In July 2013, Chris was named the Asst. Deputy Director of the Preparedness, Response and Interoperability Division, and in November 2018, he was appointed as the Asst. Deputy Director of Emergency Management and serves in this position today. 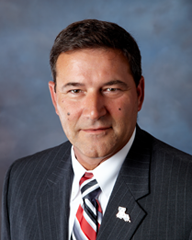 In 2007, Chris was elected on to the Board of Directors for the Louisiana Emergency Preparedness Association (LEPA) and in 2013 he was re-elected for a third term. He also serves as a member on the Louisiana Emergency Response Commission (LERC) and the Louisiana Emergency Response Network (LERN). Chris is married to the former Robin A. Leonard of Cecilia, LA and has two (2) children, Cody and Jenna, and three (3) grandchildren, Ethan, Ahnah and Emma.